Sometimes you need to get away and reboot your muse in order to get your writing flowing again. This exclusive retreat is for you! This writing vacation is capped at 12 participants, ensuring you get the most out of your time here. This retreat is organized and facilitated by Darcy Nybo of Victoria, an international award winning author and writing instructor. You’ll also learn from one of the best in the business, Jonas Saul. Jonas has sold over two million books, the majority of them self-published. He then went on to land a literary agent at Gandolfo Helin & Fountain Literary and Dramatic Rights Management. One of his latest books, The Immortal Gene, will be on screen in the near future. Another of his latest creations, The Future is Written, is currently being made into a TV series. When you want to relax, reboot your muse and learn from the best … this writers’ retreat is for you! 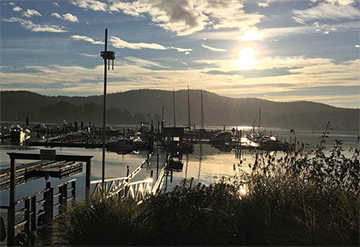 Sooke Harbour Resort and Marina provides the background for learning, recharging and mingling with fellow writers. Click here for some other great photos of the area, and the rooms at Sooke Harbour Resort and Marina. 3-5 pm: Check in Friday afternoon into the room of your choosing. (see below for rooms and retreat rates). 7-9 pm: Wine and appetizer mixer on the deck overlooking the ocean. 1-3:30 pm: Free time! Take an ocean wildlife tour or a fishing charter for the afternoon. Or you can go to your room and write – or explore the area! 3:30-6 pm: Back on dry land. More writing or exploring time. Do what works best for you. 6-8 pm: BBQ time! We’ll bring the food, you relax and get to know your fellow writers. 9 am-2 pm: Two mini-seminars on success through self-publishing with Darcy Nybo and Jonas Saul. 7-9 pm: Q & A by the fire (inside if it’s raining) with Darcy Nybo and Jonas Saul. 9-10:30 am: Goal setting and accountability – you set the goals, you sign the contract! 10:30-11 am: Pack up and check out. *This is a 19+ retreat. If you prefer not to drink wine, please let us know if you’d like an alternative beverage. ** Vegan and Gluten free diets can be accommodated for the BBQ at an additional cost of $10. This is an intimate retreat with a maximum of 12 guests. To see rooms and views, visit our Rooms and Views page. Please note that a deposit of $400 is required to hold your space. Contact the organizer if you wish to place a deposit to hold your spot. Please let them know which room you prefer. The remainder of the fee must be paid by February 22, 2019. Deposits are NON-REFUNDABLE; however, they are transferable. Please contact the organizer if you wish to transfer your spot.